A delicious Greek semolina cake recipe (samali) infused with the aromas and blends of mastic and garnished with a lemon and rosewater scented syrup! Greek semolina cake (samali) is a traditional Greek cake recipe, made with semolina instead of flour and yogurt instead of milk, which makes it extra crunchy and moist. The only thing you have to be careful about is to use full fat, drained, Greek yogurt, so that the cake won’t become gummy. Traditionally, this Greek semolina cake recipe calls only for coarse semolina, but if you prefer a thinner texture, you can substitute with thin. Samali (Greek semolina cake) is a traditional Greek dessert which falls under the category of ‘Siropiasta’, which means syrupy Greek desserts. Syrupy Greek desserts are very popular among Greek cuisine and with good reason! From extra syrupy cakes like portokalopita, karidopita or ravani to traditional Greek pastry desserts, like galaktoboureko or kataifi and of course the famous traditional Greek baklava dessert. One thing all these Greek desserts have in common is of course the moist of scented syrup that makes each one simply irresistible! Greek semolina cake (samali) owes its full and rich flavour to the aromatic spice of mastic used in this traditional samali recipe, which gives a really characteristic flavour and smell. Once put in the oven, the intense aromas permeate the house and bring back childhood memories. Freshly ground mastic (masticha is an aromatic spice from Chios island) is essential to prepare this samali recipe, giving the traditional Greek semolina cake its distinctive taste. (You can purchase mastic at Greek grocers or online). To prepare this Greek semolina cake recipe (samali), use pestle or a blender to ground the masticha, along with a pinch of sugar and set aside. (Mastic will give Greek semolina cake its distinctive taste and amazing smell. But be careful not to add any more mastic than this samali recipe calls for, as it will leave a slightly bitter taste to your Greek semolina cake). Place the yogurt in a bowl and add the baking soda. Blend to combine and set aside. In another bowl add the semolina, sugar, ground mastic and baking powder and blend with a spoon to combine. Add the yogurt mixture in the semolina mixture and whisk until the mixture is smooth and all the ingredients combine. For this Greek semolina cake recipe (samali) you will need a large baking pan, approx. 38*28cm. Butter the bottom and sides of the pan and pour in the mixture. The mixture for this Greek semolina cake is a little bit tight (not liquid) so even out the surface of the samali using a wet spatula. Cover the samali (Greek semolina cake) with a towel and let it rest for 3 hours. 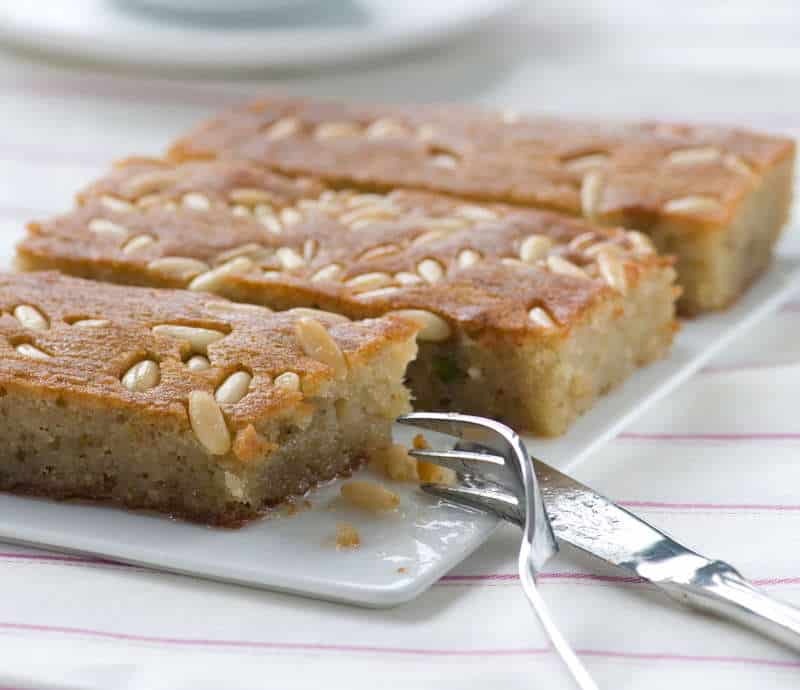 Using a knife score the Greek semolina cake into little individual pieces and garnish with blanched almonds. Bake the samali in preheated oven at 180C for 35-40 minutes, until nicely coloured and cooked through. In the meantime prepare the syrup for the Greek semolina cake. In a small pot add all the ingredients for the syrup and bring to the boil. Let the syrup boil for 2-3 minutes, until the sugar was dissolved and the syrup has slightly thickened. Set aside to cool. Turn the cake out of the oven and using a cooking brush, brush the top with the melted butter. Ladle slowly the cold syrup over the hot samali cake, allowing each ladle of syrup to be absorbed, before ladling again. Allow time for the syrup to be absorbed. Let the samali cake cool down completely before serving. Serve this extra syrupy Greek semolina cake with a full spoon of kaimaki or vanilla ice cream. Enjoy! Hello. I have two doubts about this recipe. First, you mean the cake must be cut before baking? Second, you cook the syrup with the lemon cut in half or the juice from it? Thank you for this and the wonderfully detailed site. With the syrup, cut the lemon in half and add to the mix. Don’t squeeze it, its literally one lemon in half. The reason for this is to get the essential oils out of if while making the syrup. My apologies for not replying sooner. Hope it turned out well if you made it today! I will try this today. Pity you did not care to answer. Thanks for the recipe anyway. thank you for your answer. Yes, it turned nicely. We are still enjoying it. I made my own strained yogurt and grounded coarse semolina from spelt grains. I had some mastic left from my last stay in Greece. The result was great. The rose water you use must be very strong, I had to put 3 tsps of natural rose water for a still subtle result. Ah that sounds simply amazing! Indeed, it was quite strong, its more like essence than water hence needed less amount. Hi Eli LOVE all your recipes, authentic to the bone!!! The word you were looking for is “score” instead of cut. GREAT WORK HERE!!!! BRAVO!! I’ve amended the recipe, thank you!! I’ve been looking for an authentic recips for forever. Thanks for this! I accidently put the melted butter in the batter. Fingers crossed I haven’t ruined it. Just another small note to say this recipe is unbelievably good! Better than any bakery version of this desert I’ve tried. Hello Ellie, only one commend: if my eyes are correct by looking the posted pictures those are not almonds you used for garnish but Pinenuts, in Greek “Koukounari”, I’m I correct? Hi there…I want to make this delicious recipe. Do I use castor sugar or granulated sugar? Please advise.